The Organization for Islamic Cooperation (OIC), based in Jeddah, Saudi Arabia, disclosed at its summit, on August 16, that it would take the question of violence against Rohingya Muslims in Burma (Myanmar) to the United Nations. 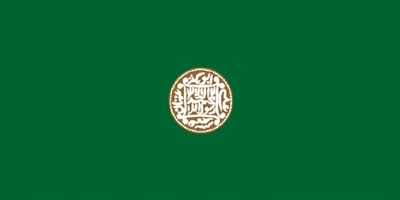 Previously, Saudi King Abdullah announced a donation of US$50 million for relief of the Rohingyas. Myanmar permitted an OIC delegation to visit the country, and will allow the Organization to coordinate relief efforts for Rohingyas displaced within Myanmar. The OIC action came as the global Islamic body suspended Syria from membership because of the widening bloodshed in that country. In June 2012, Rohingya Muslims were attacked in Rakhine State (formerly Arakan State) on the western Myanmar frontier with Bangladesh, by the local Arakanese and Bamar (Burman) Buddhist majority. The crisis followed rumours that a Buddhist woman had been raped and murdered by Rohingyas. Officially, 80 people were killed – mainly Rohingyas – and 70,000 people from among both communities were left homeless in the June outbreak. Countless Rohingya Muslims attempted to flee from Myanmar into Bangladesh and India. The Muslim Students' Organization of India and the All India Buddhist Council appealed jointly for Indian government aid to the displaced Rohingya Muslims. The refugee issue has challenged the Rohingyas, international humanitarian organizations, and regional governments. Myanmar is currently undergoing a military-led transition to democratic rule. Yet the Myanmar government was accused by Human Rights Watch (HRW) of standing aside during battles between Rohingyas and Rakhine Buddhists. Myanmar security forces, after failing to intervene and stop the skirmishes, then shot at Rohingya protestors, organized mass arrests from among them, and committed rapes, according to HRW. Myanmar authorities arrested 10 international aid workers, including three Myanmar nationals affiliated with the United Nations High Commission for Refugees (UNHCR), in July. The aid representatives were accused of siding with Rohingyas in the communal fighting. Seven of the detained humanitarian personnel were released in mid-August. They included four Dutch members of Doctors Without Borders and two UNHCR representatives. The Myanmar government has announced the establishment of a 27-member commission of enquiry into the Rakhine crisis. Rohingya Muslims most recently accounted for about a fifth of the four million residents of Rakhine State. Rohingya Muslims are stateless, denied citizenship and other rights in Myanmar. Opponents of Rohingya citizenship in Myanmar claim the Muslims are illegal immigrants from neighbouring Bangladesh. In 1978, about 200,000 Rohingya Muslims fled into Bangladesh after an operation directed against them by the Myanmar military. Again in 1991-92, more than 250,000 Rohingyas crossed the Bangladesh frontier westward. The Bangladesh authorities, however, have ceased accepting Rohingya refugees. Rohingyas have been banned from immigrating to the southeast Asian Muslim countries of Malaysia, Indonesia, and Brunei. Most Rohingyas and even considerable Indian media admit that the motive for this is racial; southeast Asian Muslims feel more in common with the Buddhist Burmese than with the "black" Rohingya Muslims allegedly from Bangladesh. In the past, Bengalis were considered enemies and competitors of the Burmans. Now the Bengalis, in the Burmese mind as well as that of the Rohingyas, have been humiliated into political non-existence. Still, parallel with the OIC announcement, Indonesian president Susilo Bambang Yudhyono said he would ask the former vice president of his country, Jusuf Kalla, to head a special mission on the condition of the Rohingyas. Daw Aung San Suu Kyi, the 1991 Nobel Peace Prize laureate, has participated in the Myanmar transition and given it international credibility. She has, however, skirted the Rohingya matter. Directly after the murders in Rakhine state, she reportedly said, "I would like to see all people in Myanmar get along with each other regardless of their religion and ethnicity." During her June tour of Europe, when queried in Geneva about the status of the Rohingyas, she stated, "We have to be very clear about what the laws of citizenship are and who are entitled to them. All those who are entitled to citizenship should be treated as full citizens deserving all the rights that must be given to them." Later, Suu Kyi shared a podium with the pop musician Bono, in Dublin. Suu Kyi then, when asked if the Rohingyas should be granted Myanmar citizenship, said, "I don't know." The failure of Suu Kyi to adequately address the difficulties of the Rohingyas has led to criticism of her, especially in the US. In the northeast Indian state of Assam, strife between Muslims and the Bodo people, mainly Hindus of Tibeto-Burman ethnicity, has appeared. As many as 80 people have been killed and 400,000 have been expelled from their homes in Assam. Because of the convoluted assignment of international borders, Assam is also northeast of Bangladesh. As in Myanmar, Assam Muslims are labeled as undesirable, racially "black" immigrants from Bangladesh. Assam's population, estimated at 31 million in 2011, is, according to the Indian government, 65% Hindu and 31% Muslim. The remainder are Christians, Buddhists, Sikhs and followers of tribal animism or ancestor-worship. Anger over the situation of Rohingya and Assam Muslims has stirred radical Islamists to create disorder elsewhere in India. The Indian government has accused unnamed Pakistani sources of spreading reports that Indian Muslims would exact vengeance on non-Muslims, causing tens of thousands of non-Muslim residents to flee Mumbai and other cities in southwest India for the northeast. Thousands of Muslims protested against the atrocities against Rohingya and Assam Muslims in Mumbai on August 11, with two people killed. In the north Indian state of Uttar Pradesh, its capital, Lucknow, and another major city, Allahabad, were shaken by Islamist violence on August 17. 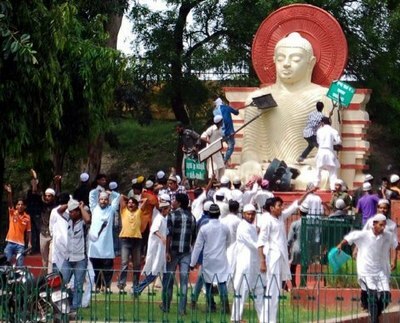 In Lucknow, Muslims protesting the attacks in Assam and the plight of the Rohingya Muslims took to the streets, assaulted members of the media, and vandalised a Buddha statue in a local park. Radical Islamist vandalism of Buddha Park statue, Lucknow, August 17, 2011 -- Photograph Courtesy of Folksmagazine. Syed Babar Ashraf, national secretary of the Lucknow-based All India Ulema and Mashaikh Board, a Sufi coordinating group, on the occasion of Eid Ul-Fitr, concluding the Muslim fasting month of Ramadan, called on Muslims "not to resort to demonstrations, [to] maintain calm and respect the law in order that Eid may be celebrated in its true spirit." He further declared, "stand firmly against all the evil forces which are trying to weaken the democratic and secular fabric of India." The lesson of the new outbreaks of anti-Muslim violence in Burma and Muslim radicalism in India is that much of it is, as in so many other cases, manufactured or magnified by manipulated rage, for political ends. The Muslims of Rakhine State, Assam, and Bangladesh, and the non-Muslims swept by anger in reaction, need to remain calm and assess their situation realistically and in the most moderate way. Bloodshed in Pakistan and Myanmar leaves India – with its Hindu, Muslim, and all other religious subjects – besieged by the problems of Islam on both its flanks. The Muslim clerics and leadership of India and Bangladesh should take the initiative in ameliorating the crisis before it produces new tragedies across the subcontinent. Above all, they should prevent destruction of any holy site or structure associated with any faith. The Koran commands Muslims (6:108), "Do not insult those the disbelievers invoke in place of Allah, for it may cause them to insult Allah out of hatred and ignorance. We (God) have made the deeds of every community pleasing to them." Indian and other Muslims, notwithstanding their anger over the events in the Myanmar borderlands and Assam, should study and heed this guidance.